gleam wrote: There's "Don's Grill" at 1837 S Western which has or had a big "Humbergers" sign. This is separate from Donald's, at 2325 S Western. It still confuses me a bit, and I see them semi-regularly. Isn't Don's Grill (which also has fried chicken prominently displayed on their signage) closed? Quite possible, I haven't been by in a little while. They got a new sign a while ago, which made me very sad. Maybe without the distinctive Humberger sign, business dried up. Would you agree that this concoction is a variant of a mother-in-law but because it doesn't contain chili really isn't one? I was under the impression that a mother-in-law, whether served in a bowl or on a bun, always contained chili. No? If not, can you tell us where a mother-in-law (definitively called as such on their menu) is still served around town that is solely a tamale on a bun? The humdinger contains chili. When I said it's a mother-in-law with melted cheese ladled across the top, I meant exactly that. You can see the beans in my pictures if you look carefully. Binko wrote: The humdinger contains chili. When I said it's a mother-in-law with melted cheese ladled across the top, I meant exactly that. You can see the beans in my pictures if you look carefully. Indeed. Sorry about that, Binko, but of the mother-in-laws I've tried, one usually doesn't have to "look carefully"! I bring up this point not to discredit your ideas about what constitutes a mother-in-law (there seems to be varying interpretations out there) but because somewhere along the way, I thought I heard that some versions of it don't contain any chili whatsoever. Yeah, I've never seen any mother-in-law without chili. Where I grew up, at the local Nicky's a mother-in-law was a bowl of chili with a tamale in it, so the two ingredients are invariably linked in my head. I didn't realize until this thread that a mother-in-law is perhaps more commonly a tamale with chili in a bun rather than a bowl. 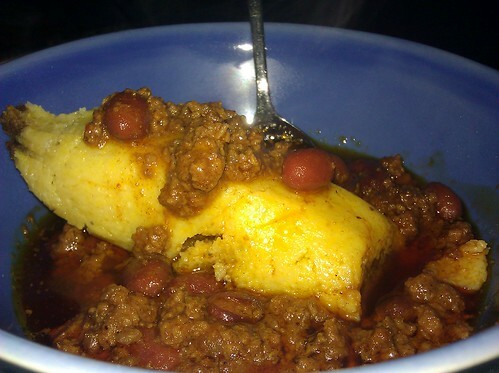 Still, tamale + chili is essential. I'd be curious, too, to hear if any places call a chililess version of this dish a mother-in-law. The chili is kind of necessary, in my opinion, to balance the sheer carb overload and add some moisture to the sandwich. Personally, I like the bun-less version much better. Although the mother-in-law with an embedded hot dog sounds like it could be pretty good. Thanks for the report and the excellent pictures (the Humdinger is a thing of beauty!). I'd completely forgotten about the Humdinger (been to Donald's but never tried one). That's what Fat Johnnie's would call a Father in Law. But at Peppo's (10303 S Roberts Rd) a Father in Law is a tamale plus hot dog, what Fat Johnnie's calls a Mighty Dog. I wonder if Humdingers (by that name) can be found anywhere other than at Donald's. I sure don't remember seeing them. stevez wrote: Is this place related to the Donald's on 24th and Western? 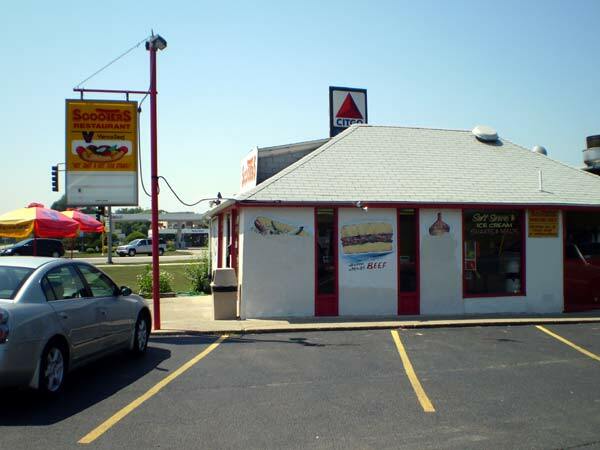 Incidentally, a picture taken at the 24th & Western Donald's is in the new (Oct 2007) Saveur. 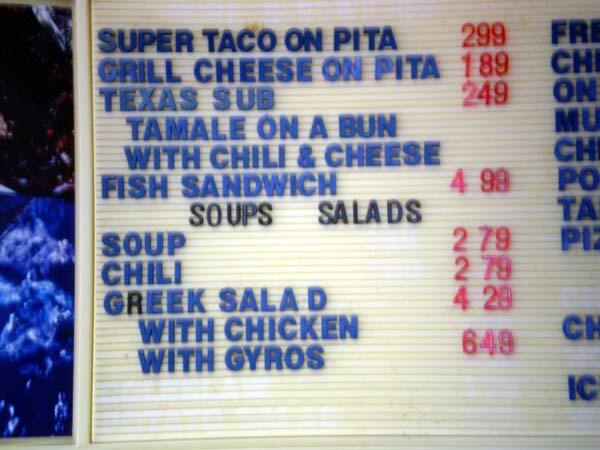 Binko wrote: They also have one other oddity on the menu, which I've never seen before: Super Taco served on Pita bread. I wasn't quite brave (or hungry enough) to try it. I don't think the taco-on-pita is terribly uncommon. You can even find them at some Nicky's (home of the Big Baby). I guess you can think of them as Chicago-style tacos Arabes. 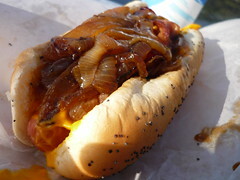 Binko wrote: Oh, yeah, and they have a foot-long Polish served on French bread, too. That's false advertising. I've had it and it's nearly a foot and a half. 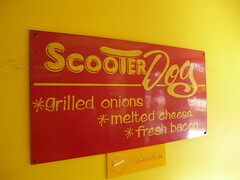 stevez wrote: The Western Ave. locations offers the smae things. Come to think of it, I recall seeing a sign for "the humdinger" hanging there, but I never took the time to read the fine print to see what it was. gleam wrote: There's "Don's Grill" at 1837 S Western which has or had a big "Humbergers" sign. The Don's Humburgers sign is gone. A pity, it was a fine old neon. No mention of Humburgers any longer (not even on the menu) but in any case they're unrelated to the Humdinger. stevez wrote: Isn't Don's Grill (which also has fried chicken prominently displayed on their signage) closed? Don's Grill (1837 S Western) is definitely still around even though the humburgers are gone (they still serve so-so hamburgers which is all the humburgers ever were). I don't remember the fried chicken but there's a fried chicken place a block or two from Don's on the same side of Western. At Don's, ham ("Try our delicious HAM off the bone . . . It's Great!!!") and biscuits & gravy get prominent billing on outdoors signs. PIGMON wrote: I was under the impression that a mother-in-law, whether served in a bowl or on a bun, always contained chili. No? That's my impression too (note my title for this thread), that a Mother in Law is a chili tamale. The nomenclature isn't rigidly adhered to, however, and occasionally a place will call a tamale on a bun (without chili) a Mother in Law. I think Peppo's is one such place. In the Lake Bluff area, there is yet a Mother-In-Law disguised as a Texas Sub. Had the potential to be really good but the dog wasn't charred and the cheese was your normal processed cheese and not Merkts so it was nothing special, but the bacon was good. All those pics look delicious! I'd like to try a mother-in-law on a bun with sour cream on top. Sounds healthy doesn't it? This is one of my favorite threads. When I found this site I finally found out what exactly that mother-in-law I see every now and then on menus is. I saw the commercial for the upcoming Chicago episode of No Reservations and was surprised and pleased to see Mr. Bourdain and what looked to be a familiar face from LTH eating mother-in-laws at fat Johnnies. Now thats getting into real Chicago and not just the deep dish pizza and portillos every other show goes. I was pissed when I heard that there are no stops for an Italian Beef on the episode and thought that it was almost as inexcusable that somebody who praises the pig like Anthony Bourdain didn't eat Jerked Pork in the Jamaica episode but thats for another day. Very cool to see that the Mother-in-Law is about to gain a whole new audience who had no idea. I figure this thread will pop up again next Tues. and thought I would share this. 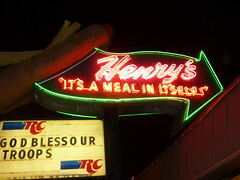 Henry's along route 66 on Ogden in Berwyn, which has the best hot dog stand sign in the land, offers three different versions of the Chicago hot dog stand tamale plus something. They also have Mother-in-Laws per request but I haven't got a picture of one just yet. Lets just say that the "Chicago Style tamale" was my first and last try of one of those things. Something about the pickle spear and tamale didn't make for a pleasant texture or taste. I love a tamale in chili and feel like the tamale often makes most dog places below average bowls of chili a little better. They also still carry BBQ beef sandwiches with pickles on top which I remember loving as a young youth and ordering often but rarely see it on the menu of spots these days. Gotta get back to Fat Johnnie's....been about 10 years. Funny thing is---I'm only about 5 miles away! From what I hear, Johnnie definitely needs to re-hab the place. I've been there since day 1, having lived only 1 block away as a kid. I used to run into John at local pubs. Good guy, his parents were awesome. Owned the Garden place next door (not even sure what's there now). Anyway---favs are cheese dog and the mother-in-law. In case anyone missed it, fans of the Mother-in-Law and Fat Johnnie's will want to tune in to tomorrow night's episode of "No Reservations," with Anthony Bourdain and ReneG. Burt's Place and Moto are also featured. 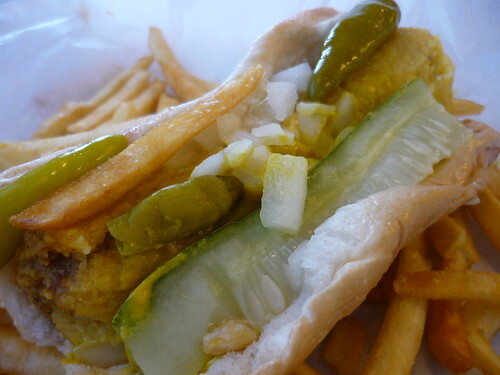 Working thru my list of places to visit I did make a stop at Fat Johnnie's to try the Mighty Dog. If you blink you are going to miss it. I actually did pass it by and had to circle around. The mighty Mighty Dog cleanly dissected. I like it! Took about a dozen napkins afterwards to clean up but it was worth it. Nice and fresh topping in the traditional Chicago style. During the South Side Saturday we found ourselves leaving Saturday open house at the Great American Cheese Collection and wondering where we should stop next. GAF mentioned that John's was just around the corner and we should snag a couple of Mothers' in Law. As photogenic as it is delicious, the Mom in Law sadly disappointed me with a distinct lack of texture (oyster crackers supplied in our to-go bag gave much-needed crunch) and slightly bland flavor. GAF explained that, to his knowledge, it's not supposed to be firey chili, but I couldn't help but hope for more zing. dansch wrote: As photogenic as it is delicious, the Mom in Law sadly disappointed me with a distinct lack of texture (oyster crackers supplied in our to-go bag gave much-needed crunch) and slightly bland flavor. GAF explained that, to his knowledge, it's not supposed to be firey chili, but I couldn't help but hope for more zing. The Wife and I did the John's GAR/GACC rotation a few weeks ago, and talking to Trixie Pea later, she made the point that there's no reason why MiL could not be a tasty snack...if only the ingredients were up to par. At John's, the chili is Hormel-class and the tamale is no Great Moment for Masa, but if one could find a good corn roll tamale and drop it in some good chili, well, I'd eat that gladly. Perhaps this calls for a well-planned One-Two Punch where you stop by your favorite spot for chili, then make your way to a delta-style tamale stand, and roll your own Mother in Law. 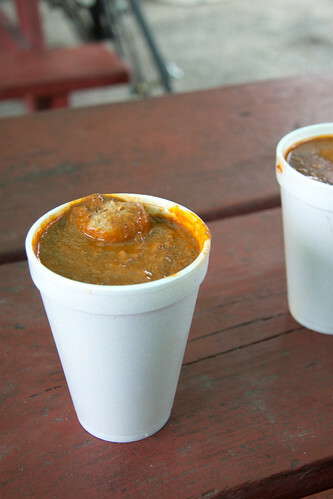 dansch wrote: Perhaps this calls for a well-planned One-Two Punch where you stop by your favorite spot for chili, then make your way to a delta-style tamale stand, and roll your own Mother in Law. I hope someone does this for next year's LTH picnic. Apparently, I just learned, one can order a MiL at Ramova Grill, though it's not on the menu. I think the quality of the tamale is probably much less important to the whole MiL experience than the quality of the chili. I am mapping my next South Side tour at this moment. Two MiLs in one month--doesn't that win me a prize or something? happy_stomach wrote: Apparently, I just learned, one can order a MiL at Ramova Grill, though it's not on the menu. I can personally vouch for the tastyness of the Ramova Grill MIL. Be sure to get the chili with no beans (of course). stevez wrote: I can personally vouch for the tastyness of the Ramova Grill MIL. Be sure to get the chili with no beans (of course). Not sure how tasty the MiL at Ramova is, their chili has always tasted like all meat Hormel chili straight from the can* to me, but it certainly has its fans. *I realize Ramova's chili is made in-house, simply saying the taste reminds me, almost exactly, of Hormel all meat chili. So, I can't say the MiL was the tastiest thing I've had ever. Or in recent memory. Or that day. In fact, it wasn't very good. I think socio/ethnologically, however, it's a fascinating dish. Definitely a Southern-Midwest style of chili--that part makes sense--but the inclusion of the tamale, questionable quality notwithstanding, is just fascinating. I remember now that Bourdain had one of these things on No Reservations. The best I can say about it is that it'd be solid drunk food. dansch wrote: During the South Side Saturday we found ourselves leaving Saturday open house at the Great American Cheese Collection and wondering where we should stop next. GAF mentioned that John's was just around the corner and we should snag a couple of Mothers' in Law. "As photogenic as it is delicious," I definitely got a chuckle out of that. Despite what a lot of people think, I'm not a huge fan of the MIL in all its forms. I wouldn't rank the one from John's as one of my favorites though its appearance and taste are significantly improved by the addition of onions and peppers. Did you try a tamale-on-a-bun at John's? That one I find even more of a challenge. Something about mustard and relish on a tamale (leaving aside the fact that the tamale is on a bun) is so wrong. John's is another of those places I like mainly for reasons other than food. Not so long ago, every neighborhood had a few such hot dog stands. They're getting rarer and rarer. Ramova Grill indeed serves an exemplary mother in law. Breakfast of champions: mother in law and fresh squeezed orange juice. i'm with reneg on ramova's chili. if you're going to eat a mother-in-law, the simplicity of ramova's is the way to go. i love their chili, and don't think it tastes like hormel. it has plenty of fat that will float to the surface, but the chili doesnt have that greasy quality i remember from canned chili. and it has lots of flavor. i love it with crumbled cornbread. They were open when I visited in late January. I imagine things could have changed since I was there. I was somewhat surprised to see tamale on a bun on the menu at Home Depot. This is the store at 47th & Western, only blocks from the Tom Tom tamale factory, so perhaps it shouldn't be unexpected. I don't think they offer chili so a true mother in law cannot be prepared. Has anyone seen these at other Home Depots or is this store simply catering to local tastes? Growing up in Springfield, IL, this is the only way we ever ate tamales/chilli. 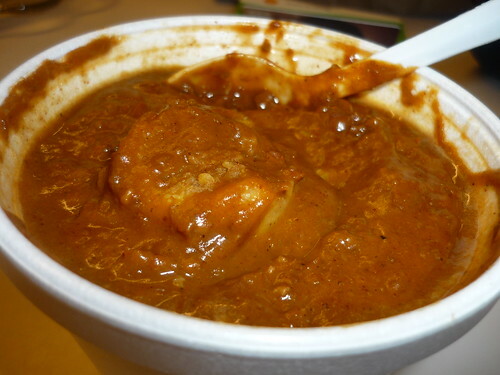 I was there last week and brought back both from Joe's Chili and had an "at home" version. The tamale is from Art's. I wanted to stop at Joe's when I was in Springfield in August. They were closed so all I could do was look through the window. I see the chili-tamale combos. I also see the chili sandwich. Do you know if that's served on a hot dog bun? I wonder if anyone has ordered a tamale sandwich . . . I've never tried to order one, but I'm quite certain they would be happy to accommodate, they have never been anything but helpful and lovely. (Even if they are utterly baffled at the enormous quantities of tamales and chilli my family purchases frozen for transport to other states for our Central Illinois chilli/tamale starved brethren.) 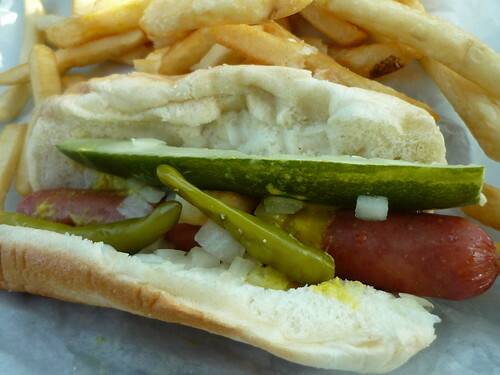 The hot dogs they serve, btw, are skinless wonders from Farmland and to be avoided at all costs. Friend of mine in Arizona alerted me to Tucson Tamale Company (http://www.tucsontamalecompany.com/Tamales.html), which offers what they call a "Dogmale." This hybrid snack bears some resemblance to both the Mother in Law and the Sonoran Hot Dog: "All Beef Hot Dog, Bacon, Onion, Tomatoes, Pinto Beans, Green Chile, Chili and Cheese"